The Open Data Directory lists products, services and research projects that leverage Linked Data. Currently, the Directory serves as an aggregator of use cases and web sites using Linked Data and is expected to evolve over time in response user requirements. The Directory is a community service project to foster ease-of-use and awareness of Open Data on the Web. The Directory has an easy to use Web interface enabling users to list: - Organization name - Contact name - Product(s) - Service(s) - Projects & Use Cases The Open Data Directory periodically gathers Linked Data from designated sites and compiles it into a summarized view of the community. It is a purely Linked Data application and not another "walled garden." Organizations are responsible for publishing their own Linked Data for the Directory to consume. The Open Data Directory includes some basic visualizations that are expected to expand over time. The site is built on open Web standards and an Open Source data platform hosted on the cloud. All of the data is freely available for download as RDF. The Open Data Directory is open and does not require W3C affiliation. I have been affiliated with eCommerce industry for 10+ years and have been part of development of datafeeds/rss for exchanging data for several companies including Amazon and now for our current eCommerce venture, Shimply. Whether it’s publishers who want to distribute their books or, any brand that want to sell their products, they all try their best to provide accurate and complete information to their direct point of contacts. However, due to lack of will/technical aptitude/laziness, that information is lost on the way to various consumer facing sites. Openlibrary is an initiative in this regard but seems like it has been discontinued. There are many other incarnations in at least books space but there are very few in other domains. Seems like even public databases of UPC codes don’t have complete information on the product itself. I will like to request other members of the group to pitch in with their ideas/if this matches their area of interest. I am more than willing to contribute data (17.5 million products information)/engg effort to make this a reality. 26-June-2013 – In an effort to help Open Data projects flourish, recently a small team of open data developers created an open, free, international directory. 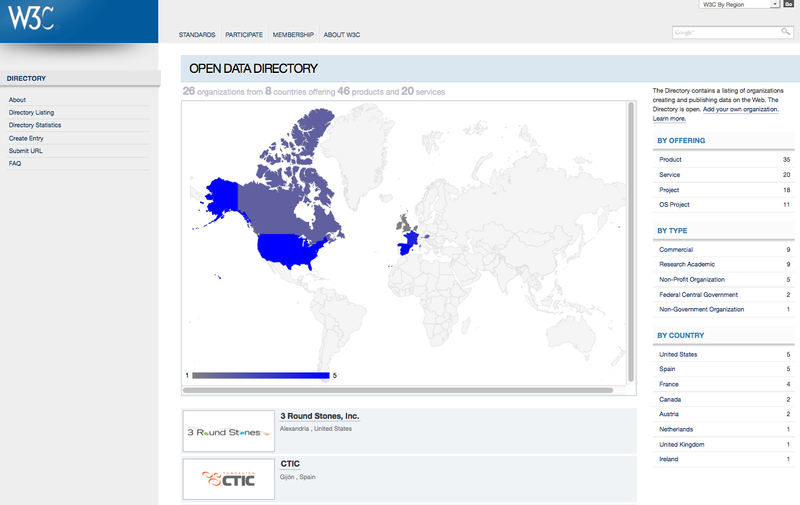 As of June 2013, the Open Data Directory showcases organizations in at least 8 countries from over 25 organizations who are publishing Open Data on the Web using a Linked Data approach. The Directory includes 46 products and 20 organizations providing Open Data services. There are hundreds if not thousands of additional projects using Open Data and in due course we hope they’ll add a directory listing to their organizations and projects. How does it work? The Directory is a purely Linked Data application and not another “walled garden”. No login or password is required. Organizations are responsible for publishing their own Linked Data for the Directory to consume. The Directory includes some basic visualizations that are expected to expand over time. The team of volunteer developers who created the Directory are long time contributors to Open Web Standards and Open Source projects that are used by over a thousand international scientific research institutions, university libraries and federal governments worldwide. Using the the Open Data Directory, anyone can read about a product, service or project and then reach out to a person affiliated with an authority, company or research institution. We believe that if people can connect with other people to sharing use cases, best practices and websites that are data-driven, then open data projects will be easier to define, justify and budget for the benefit of citizens around the world. What is the future of the Open Data Directory? Going forward, the Open Data Directory Community Group aims to enhance and foster the ecosystem of people and organizations who are interesting in making it easier to find, access and combine Open Data on the Web. We look to the community to help guide the requirements and future development of this project. Who is behind this project? The international team of developers in this Community Group all work on a variety of Open Data projects for different organizations. Some work with people who are combining open government data with enterprise content; others are creating dashboard Web apps that combine many open data sets from government authorities to produce robust mash-ups of previously unconnected content for improved response to natural disasters; and others are supporting government transparency initiatives. What is the history of the project? The Open Data Directory was a deliverable produced by an active team within the W3C Government Linked Data Working Group during the June 2011 through May 2013 time frame. The Working Group’s mission is to help governments around the world publish their data using effective and usable Web technologies. As part of the eGov Activity, the Government Linked Data Working Group was tasked with collecting and making available information about government Linked Data activities around the world. If you’re interested in learning more about this W3C Working Group, please see the charter. Per the charter, the Working Group has transitioned the site to the Open Data Directory Community Group effective June 2013.
on a publicly accessible Web server for the Open Data Directory to harvest. Join the Open Data Directory Community Group! As members of the international Open Data Community, we hope to share more about what we’re doing and how we’re using Open Data on the Web to improve human knowledge and international cooperation. Let’s use connected data for the public good. Please join the Open Data Directory Community Group today so we can collaborate on this important project! co-founder & CEO 3 Round Stones, Inc.